The potential use of high contrast X-ray microtomography (XMT) for the reading of fragile historic documents without the need to physically unravel them is a new analytical imaging development in the field of conservation however, it is important to first assess if there is any evidence of change in the parchment structure during scanning by XMT. Modern and historic parchment samples were exposed to X-rays using the high contrast XMT equipment. Attenuated Total Reflection Fourier Transform Infra-red Spectroscopy (ATR-FTIR), SDS-polyacrylamide gel electrophoresis (SDS-PAGE), Near-infrared Spectroscopy (NIR) and X-ray diffraction (XRD) were utilised to investigate whether there is any evidence for change to collagen within parchment samples after exposure to XMT. Results show that the inherent differences in the parchment structure due to the material source, production and storage appear to produce larger differences than that due to the exposure to XMT. This indicates that XMT may be a suitable technique for data recovery from parchment samples that cannot be unrolled. Parchment has been used as a writing material for over a thousand years and was developed in response to socio-economic changes. Parchment was advantageous over stone, wood, wax or papyrus because it is light weight, durable and the source of the material- animal hide - was widely available. Although parchment is an incredibly stable material, these objects inevitably change overtime, which can in many instances cause parchment to lose mechanical strength and become brittle and damaged . Parchment artefact deterioration also poses the problem of the collagen degradation product – gelatine - gluing pages of a book or layers of a scroll together, and making pages themselves brittle and difficult to unfold [2, 3]. In some cases, the parchment has deteriorated to such an advanced state that any attempt to unravel the scroll would cause catastrophic fragmentation, rendering the written information contained therein permanently inaccessible. In the last four years X-ray microtomography (XMT) has been developed in a joint collaboration (The Apocalypto Project) between Queen Mary University London and Cardiff University to determine unknown text from rolled parchment artefacts (as shown in Figure 1). XMT utilises advanced image processing algorithms to enable the reading of fragile historic documents without the need to physically unravel them. The advantages of using XMT is that both parchment and paper have low X-ray attenuation where as the iron gall ink used in many cases to create the written text provides excellent X-ray contrast [4, 5]. A collaborative project with the Norfolk Record Office to determine unknown text from rolled parchment artefacts. a) An example of a rolled parchment artefact donated by the Norfolk Record Office. b) An image of the virtual unrolled microtomography data using advanced image processing algorithms. Although the development of this equipment to read damaged historic documents is a potentially exciting development in the field of conservation, it is important to first assess if there is any evidence of change in the parchment structure during scanning by XMT. This study analyses the extent of collagen structural and conformation change due to expose of X- rays during the scanning process of XMT. Previous studies have concentrated on the effect of radiation on the physical properties of books (i.e. cellulose and paper) [6–9] and very few studies have investigated the effect of radiation on parchment [10–13]. 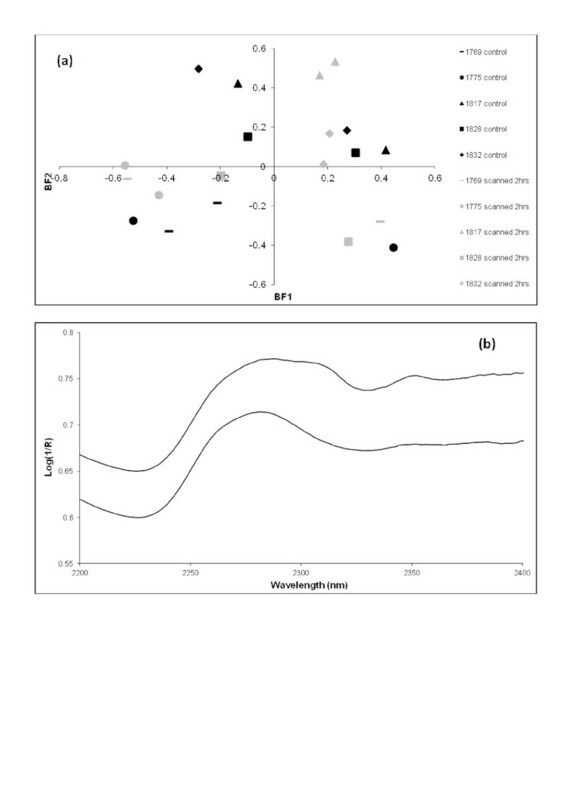 Therefore in this study a number of complementary scientific techniques are used to compare parchment samples before and after exposure to X-rays using XMT to ensure no detectable change is observed. 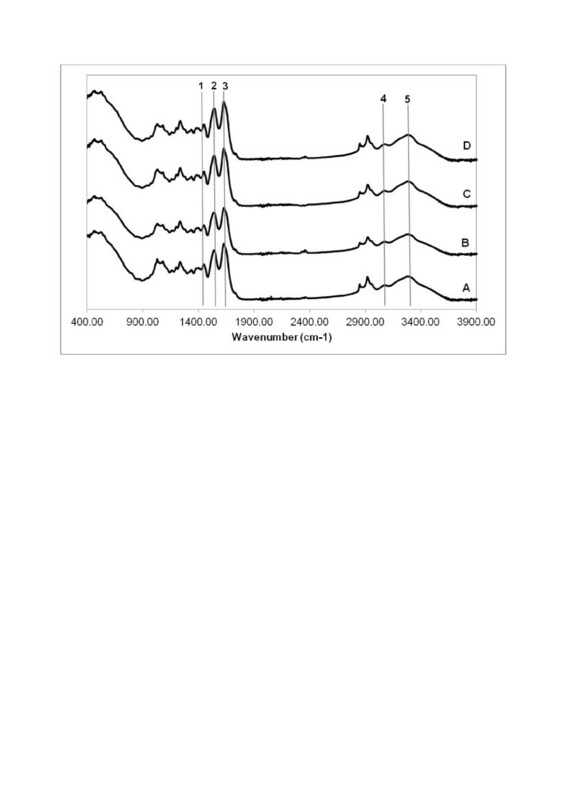 The techniques used are Attenuated Total Reflection Fourier Transform Infra-red Spectroscopy (ATR-FTIR), SDS-polyacrylamide gel electrophoresis (SDS-PAGE), Near-infrared Spectroscopy (NIR) and X-ray diffraction (XRD). ATR-FTIR allows the observation of the conformational changes in the triple helical structure of collagen, SDS-PAGE is used to assess the molecular integrity of the collagen within the parchment, NIR can penetrate further into a sample and is therefore beneficial when investigating parchment as a bulk material and XRD is used to assess the structural integrity of the collagen molecules. In each case the evidence for change between samples that had been exposed to X-rays for tomography and their respective control is assessed. It has previously been shown that ATR-FTIR can be used to determine conformational changes of the collagen and gelatine components within parchment artefacts and determine if structural degradation has taken place . Change in the collagen structure is characterised by changes in the energy needed to vibrate functional groups due to alterations in the steric forces that surround molecules. Therefore differences in the wavenumber of absorptions bandings can be used to determine if exposure to X-rays has altered the conformation of the collagen and gelatine components of parchment. In Figure 2, spectra from the modern parchment sample - generated from the ATR-FTIR analysis- have been normalised and overlaid to show if changes in the position of absorption bandings occur after samples have been exposed to X-rays. It is clear that the position of the Amide III, II, I, A and B banding envelopes do not change after the sample has been exposed to X-rays. Furthermore, we do not observe the characteristic increase of intensity of the asymmetric and symmetric CH2 vibrations at ≈ 2922 and 2852 cm-1 respectively, which arise from additional CH2 vibrations of the polypeptide backbone as the collagen molecular structure unfolds. 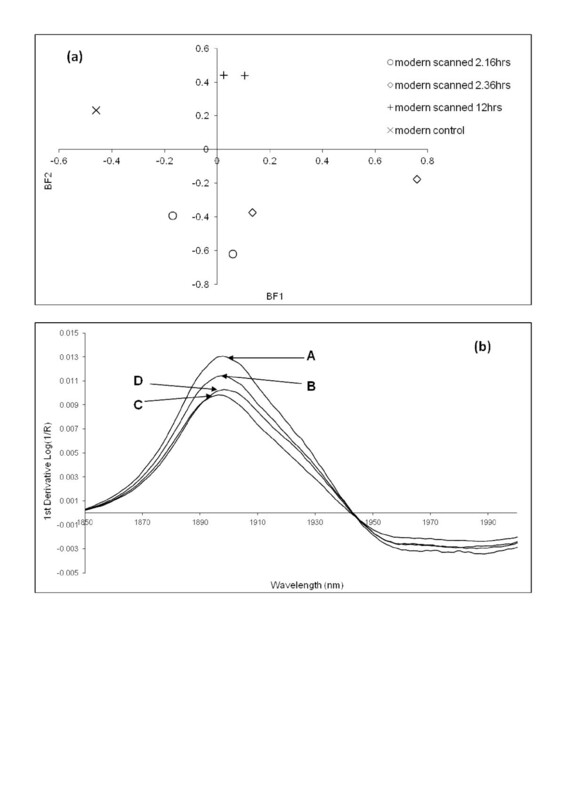 Overlaid ATR-FTIR spectra of modern parchment samples, (A) untreated control, (B) 2.16 hrs scanned, (C) 2.36 hrs scanned and (D) 12 hrs scanned by the XMT. (1) Amide III, (2) Amide II, (3) Amide I, (4) Amide B, (5) Amide A. Since the FTIR spectra for the parchment samples showed little evidence for systematic changes with radiation, principal component analysis was used to see if small changes in signal differences between samples could be revealed. The eigenvalues for the first 5 basis functions were determined for the FTIR spectra; Figure 3 shows the first two basis functions. This showed that the variation between the samples was greater than any changes induced by the exposure to X-rays. This is the case in all five of the basis functions extracted; however only the most significant basis functions 1 and 2 are shown here. A scatter plot of the eigenvalues of basis function 1 versus basis function 2 for the modern and historical samples. The variation in the eigenvalues of the base functions is greater between the samples than the effect of X-ray exposure of a specific sample. Cyanogen bromide (CNBr) digestion specifically cleaves proteins at methionine residues, therefore producing a characteristic banding pattern when subjected to SDS-PAGE . With collagen, the CNBr digestion of the type I α1 and α2 chains results in over 10 peptides of which around 7 are easily resolved as characteristic fingerprints on gel electrophoresis. Changes in the peptide pattern from the standard profile and the relative contribution of a background that corresponds to non specific peptide fragmentation may indicate changes in the cross linkage or fragmentation of the peptides induced by irradiation. Results (not shown here), indicate that we could not detect any visual change in the separation of the peptides between control and irradiated samples. Near Infrared spectroscopy has developed as a powerful tool for the analysis of historical material in recent years, including studies on parchment . Given a uniform material and large enough library of samples, statistical methods such as partial least squares (PLS) can be used to develop predictive models based on NIR spectra. For studies on smaller sample sets, where specific chemical changes are being assessed, principal components analysis (PCA) is used. Proteins such as collagen are measured in the Near Infrared region through functional groups such as amides and C-H functional groups. In terms of parchment samples analysed the main peaks observed in the spectra are listed in Table 1. Given that the bands observed are relatively diffuse compared to Mid Infrared spectroscopic bands, statistical analysis is usually carried out to determine any subtle differences in spectra collected from samples. Principal components analysis of the NIR spectra of modern parchment samples showed little in terms of differences between control samples and irradiation time. Figure 4a shows that the control is separated from the irradiated samples; however, there is no systematic change for basis function 1 or 2 in irradiated samples with exposure time. 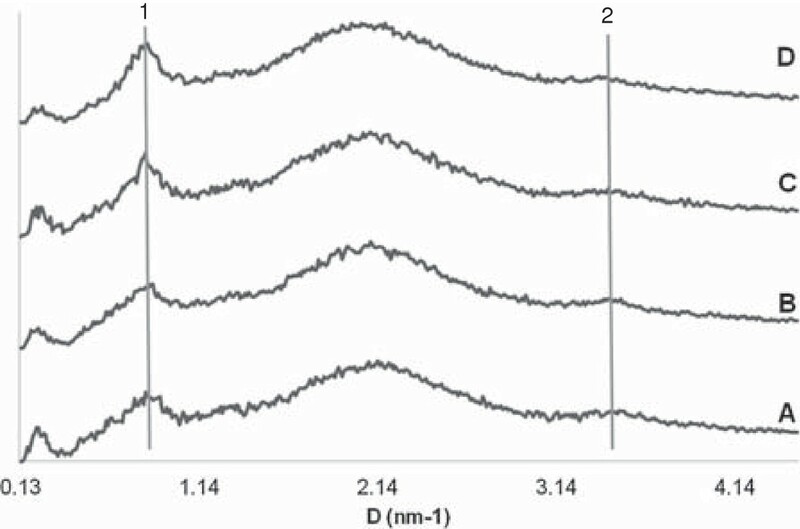 Figure 4b, however, shows that there are no differences in terms of the protein peaks, but rather the only difference of any significance between control and irradiated samples is a subtle difference in sharpness of the water peak, as shown by first derivative spectra. Principal components analysis of the NIR spectra of modern parchment samples. (a) A scatter plot of the eigenvalues of basis function 1 versus basis function 2 for the modern samples. (b) First derivative of the Log(1/R) spectra of modern parchment samples. The more intense peak shown at 1900 nm indicates a steeper slope leading to the water peak at 1947 nm in the Log(1/R) spectra. Modern control (A), Modern scanned 2.16 hrs (B), Modern scanned 2.36 hrs (C) and Modern scanned 12 hrs (D). The historical samples separated along the second basis function into two groups (Figure 5a). The 1769 and 1775 samples are in the negative region compared to the remaining samples. This can be explained by the detection of lipids by NIR (Figure 5b). These samples have previously been examined for lipid content , and the samples with the highest lipid content were the 1769 and 1775 ones with 3.96 and 7.28 percentage by weight respectively. The 1817, 1828 and 1832 samples contained 0.25%, 1.34% and 0.04% lipids respectively. Figure 5b shows the presence of a distinct lipid fraction in the 1769 and 1775 samples, which is not prominent in the other samples. Following irradiation, the samples continue to separate along the lines of lipid content. Principal components analysis of the NIR spectra of historical parchment samples. (a) A scatter plot of the eigenvalues of basis function 1 versus basis function 2 for the historical samples. 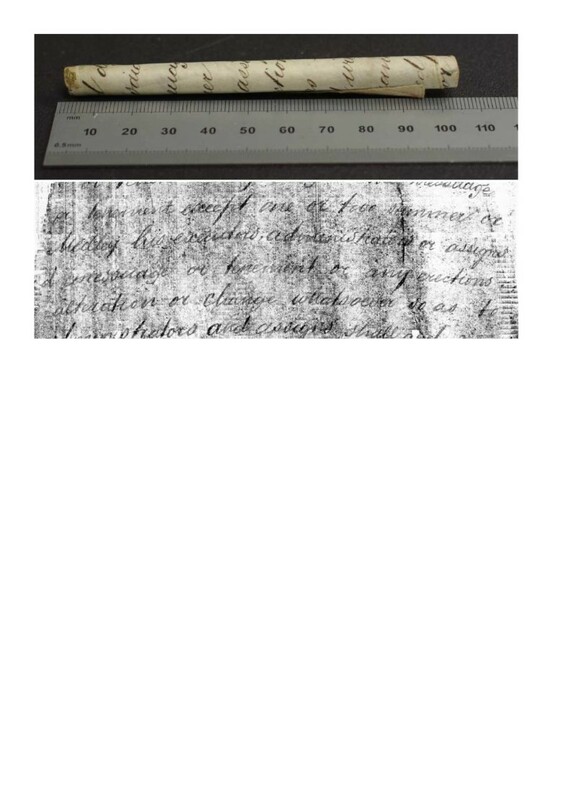 (b) Log(1/R) spectra (bottom) of the 1769 (top) and 1832 (bottom) samples. The 1769 spectra shows a peak at 2310 nm which can be assigned to lipids, which is absent from the 1832 spectra. The wide angle X-ray diffraction signal of parchment is contributed mostly from the collagen and the mineral phases. The presence of calcite can in some cases produce a characteristic spike (not shown here). The fibrillar orientation is a two dimensional feltwork in most parchment samples, and therefore the collacted XRD patterns display two-dimensional isotropic rings . The diffraction range covered by the detector here presents an interference function corresponding to the lateral intermolecular interference function, the molecular transform of the helix containing both lateral and axial components of the helix and a diffuse scatter corresponding to uncorrelated molecular structures. 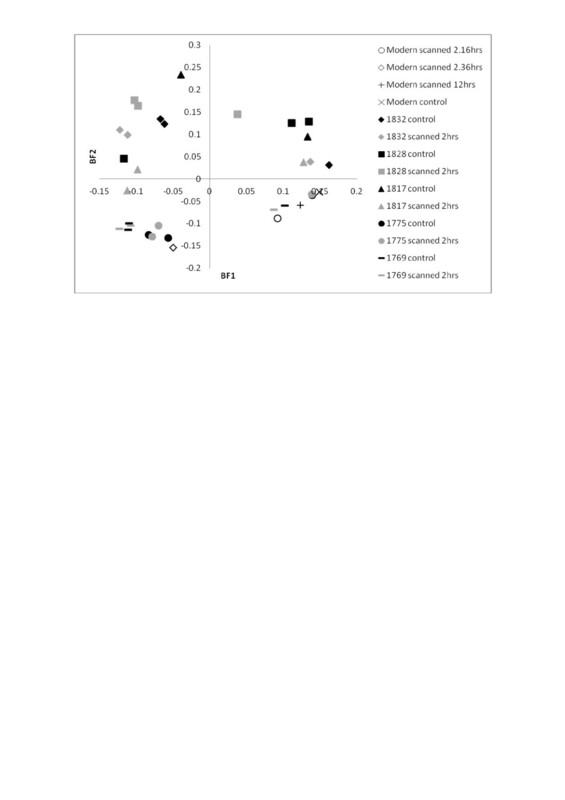 A visual inspection of the intensity distribution could not identify any systematic changes to the collagen diffraction signal or diffuse scatter contribution between the irradiated and corresponding control samples. Figure 6 shows the two-dimensional X-ray diffraction linear traces of modern parchment samples for the untreated control and scanned samples were no detectable change was observed in the (1) Intermolecular lateral packing, (2) Helical rise per residue. Principal component analysis was used to examine if there were differences between samples. Figure 7 shows the scatter plot of eignevalues for basis function 1 versus basis function 2 for the modern and historical samples. Here the eigenvalues separate between control and irradiated historical samples; however, there is no systematic detectable change as a function of irradiation. The modern samples exposed for a series of different timescales showed little difference in basis function 2 and even less in basis function 1. Overlaid XRD linear traces of modern parchment samples, (A) untreated control, (B) 2.16 hrs scanned, (C) 2.36 hrs scanned and (D) 12 hrs scanned by the XMT. (1) Intermolecular lateral packing, (2) Helical rise per residue. A scatter plot of the eigenvalues of basis function 1 versus basis function 2 for the modern and historical samples. The interaction of electromagnetic radiation with matter has been studied for over a century in most fields of modern science. In the case of biomacromolecules, the effects of a wide range of electromagnetic spectra have been used as an agent for change in bioactivity, biopolymerisation and also in biodegradation. The use of electromagnetic radiation to probe chemical and structural information from macromolecules has also been the backbone of much of our understanding of modern biochemistry. However there has always been the potential issue that the nature of the probe alters the system under study, therefore if the radiation is capable of acting as an agent for change then its use as a probe has to be carefully monitored. Biomacromolecules are most likely to be investigated in a hydrated state, since this is closer to in vivo conditions. Water also has an effect on biomacromolecular change since the radiation induces production of free radicals in water that then attack groups in macromolecules to induce crosslinkage, modification of groups, or bond scission . The demonstration of change by irradiation has been documented for molecules such as collagen for over 50 years. The exact basis of collagen modification is still under debate; polymerisation, fragmentation and change of side chain properties have been reported for irradiation from Gamma to tera Hertz wavelengths [20, 21]. As with work preceding this, we have used a number of physicochemical measurements that were designed to detect different possible changes in the molecular structure and hierarchy of collagen in parchment. The dry environment of parchment storage means that some protection against bulk water mediated free radical damage is provided to the collagen molecules. We have been careful to use the term change here as opposed to damage since damage is a relatively subjective description that is dependent on the opinion of the observer. Change induced by irradiation in historical samples is a critical consideration in the suitability of XMT as a technology for data recovery. The process carried out here was to use a series of physicochemical techniques to examine the various facets of collagen structure that may indicate change in the collagen and thence parchment structure at a number of levels from molecular vibration modes to helical integrity and overall peptide structure. The samples used in this study consisted of modern (made within the last 10 years) and historic (dating from 1769 – 1832) parchment documents. The historic samples were donated by The National Archives of Scotland and the modern parchment samples were from Wim Visscher, Cowley’s, Newport Pagnell, UK One half of each parchment sample was exposed to X-rays using the high contrast XMT equipment using the exposure required for tomographic imaging. The other halves of the samples were used as control samples. The X-ray tube used during the experiment has a voltage of 30 kV and a current of 0.54 mA. The distance to the sample being scanned was 10 cm and 0.1 mm of Aluminium was used as a filter material. Using GATE / GEANT v6.1 there is less than 60 Sv/h as detected by a perfect integrating hemisphere detector 10 cm from the X-ray aperture. A scroll in the same position would intercept between 10% and 100% of this radiation depending on the scroll diameter. Table 2 provides details of the parchment ages and exposure time in the X-ray beam. After exposure samples were stored in a stable environment of 35% RH at ambient temperature to ensure consistency between the samples upon investigation. *Sample age is estimated from dates inscribed on the parchment sheets at the time of initial parchment use. ATR-FTIR spectroscopy was conducted using a Thermo Nicolet 380FT-IR Spectrometer. Spectra were recorded over a wavelength of 400 cm-1 to 4000 cm-1 at 32 scans per sample and a resolution of 4 cm-1. Background readings were collected and subtracted from each spectrum before data output as described in Gonzalez et al. . Spectra were collected from both the grain and flesh side with three replications per sample. Samples of parchment (15 mg) were digested in a solution containing 15 mg CNBr dissolved in 1 ml formic acid (70%, w/v) at room temperature for 24 hours . SDS-polyacrylamide gel electrophoresis (SDS PAGE) using Mini-PROTEAN TGX 10% gels were carried out in a Mini-PROTEAN 3 Electrophoresis cell (Bio-Rad Laboratories Ltd, USA) on the CNBr digests of parchment. Staining of the gels was performed with EZ Blue Gel staining reagent (Sigma-Aldrich Ltd, UK). Samples were analysed using a LabSpec 5000 FR Spectrometer. The system has a total spectral range of 350 to 2500 nm. The contact probe was placed against the sample, and spectral data were collected. At each position the exposure time was five seconds, equating to fifty spectra being collected and then averaged. Spectral data were presented as the logarithm of the inverse of the reflectance [log(1/R)]. Data were pre-treated by selecting the region from 1300 to 2400 nm to correlate with the collagen properties, and to exclude an area of high ‘noise’ between 2400 and 2500 nm. Additionally, the spectral region from 1820 to 1840 nm was excluded from statistical processing as it represents the overlap between two of the spectrometers within the Labspec system, and can often manifest itself as a ‘step’ in the data. The first derivative of the spectra were used for the statistical analysis of the data. Wide angle X-ray diffraction measurements were collected using the NanoSTAR (Bruker AXS, Karlsruhe) X-ray facility. Parchment samples from before and after exposure to a dose of X-rays using the high contrast X-ray microtomography equipment were mounted in the sample chamber with the primary plane of the parchment lying perpendicular to the direction of the X-ray beam. The sample to detector distance was 4 cm and scattering profiles were collected over one hour exposures. Three replications per sample at different points on the sample were conducted and background subtractions of the empty diffraction cell were made. The collected data was converted into one-dimensional profiles and analysed using in-house software as described in Wess et al. . The characteristics investigated using XRD are the distances in the lateral plane between molecules in the collagen fibril (intermolecular lateral packing) and the distances between amino acids along the polypeptide chain (helical rise per residue) . Principal Components Analysis (PCA) is a mathematical technique used to reduce the number of variables in the dataset and is used as a visualisation technique to observe similarities and differences in the dataset. The PCA calculations for the FTIR and XRD were conducted using in-house developed software . PCA was carried out on the NIR data collected using the GRAMS IQ program (Thermo Scientific). 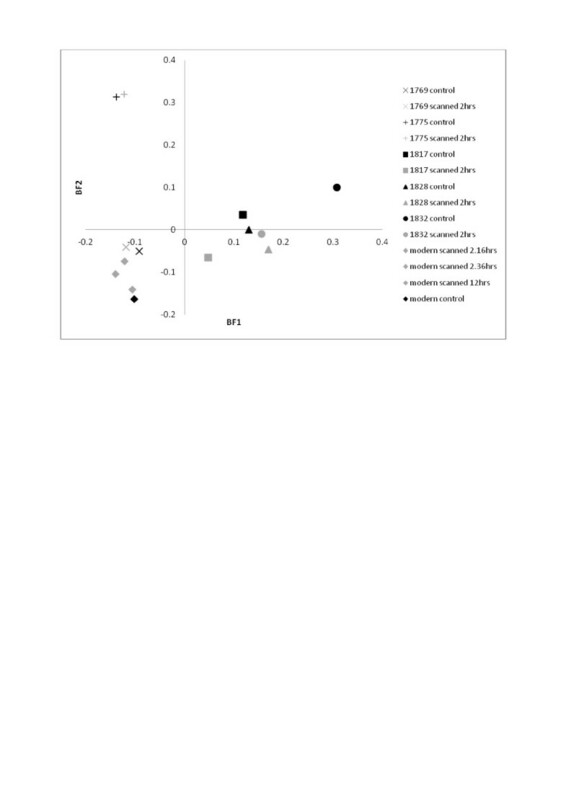 Unlike other NIR analysis of collagenous materials, the composition of the samples was not known in great detail in terms of species, production methods, area of skin taken, etc. Thus, when interrogating the spectra in this fashion, differences between sample sets are highlighted, but not used as a predictive algorithm. Our overall impression from the techniques used shows that we cannot detect a systematic change to the collagen chemistry or structure that is an effect of the simulations of XMT radiation we are using to read documents. Parchment documents contain inherent differences in their molecular structure due to the material source, production and storage, and these effects appear to produce larger differences that that due to the irradiation carried out here. This indicates that XMT may be suitable for data recovery from parchment samples that cannot be unrolled. Water mediated radical formation may be the main agent for change in these materials, and therefore parchment stored at a relatively low relative humidity (RH) may be afforded some protection from the main mechanism of protein change. The project to use XMT to recover information from historical documents is intended for use on samples which are so fragile or stuck together that they are refractive to usual procedures used by conservators using humidity to unroll documents. These processes in themselves are believed to produce physical changes to the document and also inevitably change the relationship between collagen and gelatine in the document. Finally the nature of the parchment materials used here are from historical and control samples that contain high amounts of collagen and are not therefore heavily gelatinised. It may be the case that the samples used meaningfully for data recovery in XMT may already be more highly gelatinised than the change that could be induced by the XMT process. This research was supported by funding received from the Engineering, Physical Sciences Research Council EP/G007845/1 and EP/G010110/1. We would like to thank the National Archive of Scotland for providing the historical samples, the Norfolk Record Office for providing the first parchment scroll to be scanned and the National Archives UK for support. We would also like to thank our collaborators Paul Rosin, Oksana Samko and Yukun Lai in the School of Computer Science and Informatics, Cardiff University. KP performed the SDS-polyacrylamide gel electrophoresis and X-ray diffraction research, analysed the data and wrote the paper. LG performed and analysed the Attenuated Total Reflection Fourier Transform Infra-red Spectroscopy research and helped draft the paper. CK performed and analysed the Near-infrared Spectroscopy research. DM and GD prepared the X-ray exposed parchment samples for investigation and helped draft the paper. TW performed the SDS-polyacrylamide gel electrophoresis, wrote the paper and designed the research. All authors read and approved the final manuscript.